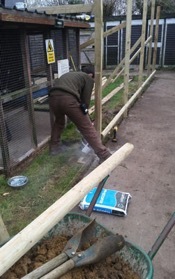 The winter months bring an opportunity for the staff of the owl sanctuary to carry out an annual maintenance audit. From this they can ascertain what needs to be done to renovate and refresh current facilities and to decide upon new developments for the following year. As all the aviaries and grounds are furnished in natural materials, an ongoing programme of maintenance and renewal is embarked on every winter. A new intake of birds for the 2016 season also necessitates new aviary builds and the extension of existing stock. To these ends, the falconry team are now adept at turning their hands to building design work, carpentry, construction, painting, roofing and landscaping, so every year the talented team undertake more improvements to the site and 2016 is no exception. Since last October, an impressive array of tasks has been completed. To date: the weatherings have been re-roofed and trimmed, the hospital has been painted, the falconers’ hut has been remodelled and the mews room renovated. The safety barriers around the whole site have also been replaced and the height raised from 2 to 3 feet. This rise has not only afforded visitors a comfortable “leaning” facility whilst observing the birds, but it also allows new information boards with Braille overlays to be accommodated on the barriers at a perfect height for reading. Other jobs have included some selective shrub clearance has opened up a new viewing lawn next to the falconers’ hut - this will be used specifically for baby birds to become accustomed to visitors, allowing plenty of space between “them" and the "us”! The debris from this project has been recycled into wood chipping for replenishing the paths in the Woodland Walk. And there's more… the boxes holding the stamps for the children’s Owl Safari have also been replaced, the dog kennels painted and new fencing and a gate incorporated into this corner of the compound. Our next big project for completion before the season starts in a few weeks time is the building of a new buzzard block. The old block will be renovated and an extension added. The latter will feature additional ledges so that the buzzards can roost higher up in the aviary, as is their preference. The Red Kites will be housed at the end of the new block, close to the flying ground, and will incorporate special hatches allowing them to be flown straight out of the aviary - quite a spectacle for visitors to enjoy. Maintenance of the site does not stop once the flying season starts - it is an ongoing issue which throws up constant challenges. However, due to the generosity of public donors, staff are always able to meet these challenges with enthusiasm and foresight - we would like to "Thank You" all for your continuing support in this respect.